I want to alert everyone to some very important information posted by Lana Elswick, the owner of Boo Boo (seen above), the World’s Small Living Dog in Height. 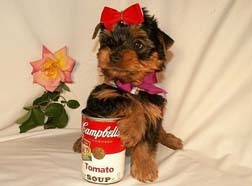 Yesterday, I posted that Brandy was crowned the new World’s Smallest Living Dog, this is only partially true! Brandy Has won the award for the World’s Smallest Living Dog in LENGTH, not HEIGHT! Boo Boo reigns supreme. Sorry Boo Boo, I didn’t mean to offend! And, thanks Lana for writing in and making that correction. In other Boo Boo news, her visit to the Boyd County Public Library had to be postponed, due her upcoming appearance on tomorrow morning’s Today Show! Entry filed under: dog, dogs, January 2008, small dog, small dogs. 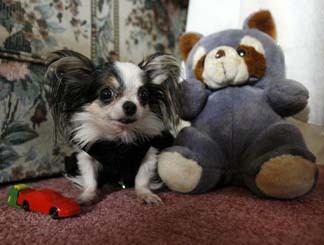 Tags: Lana Elswick, World's Smallest Living Dog in Height, World's Smallest Living Dog in Length. Those pups are adorable. I just love small dogs. Of course I’m partial to them because I have three Chihuahuas. They are all giants compared to Boo Boo and Brandy. Two of them weigh 6 pounds and the other one is a “football” at about 12 pounds. Come by my blog and say, “Hi”. Tinky, Sissy and Jonesy would love to meet you. Your pups are adorable, especially the football! I used to have a chihuahua who tipped the scales at 13lbs! OneRepublic sings, “It’s too late to apologize.” But it’s not! Seriously, thank you for that SD, I finally feel at ease. Where do you think the dog was trying to travel to on the iceberg? And is this also a viable means of transportation for us boring humans?